It has also created perverse incentives for institutions world-wide to tailor their collateral and route it via euro zone affiliates. Securities tied to loans to consumers and for auto purchases in Australia and South Korea, for example, have been pledged as collateral, something the ECB probably did not anticipate when the rules were first put into place. "This report does an excellent job documenting what people outside the region have been slow to understand - that Silicon Valley is a fairly brutal environment," Joint Venture President Russell Hancock wrote in an e-mail. "Our performance on the global stage doesn't necessarily translate into regional prosperity, the kind that is widely shared. So you get this troubling picture where our companies are thriving but the region feels worse off." This is about the worst time imaginable for serious doubts to be raised about the credibility of government statistics. Walking the tightrope between recession and inflation is a tough enough job for the Monetary Policy Committee. But if the committee can't trust the data on which decisions must be based, each member has effectively been blindfolded. Don't be surprised if they all fall off. Pay particular attention to the importance you give to thoughts that are self-sabotaging, i.e., "I know this is not going to work." Or, just re-read your e-mail to me when you wrote, " I somehow don't feel that I have enough of a positive outlook…." I have this tendency to revert to the mean it seems. Can't say I didn't try though. Take the following picture for example. 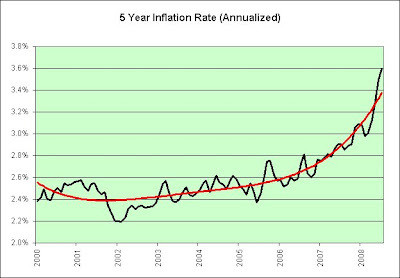 It shows the average annual inflation rate over the previous five years. It isn't the black line that concerns me. Oil's dropped in price a bit recently and therefore that black line may come down a bit. It's done that quite a few times in the last few years. The red trend line (4th order polynomial) is another matter entirely. I have no idea what it will do in the coming years, but I'd be hard pressed to bet that it will ever fall below zero percent (long-term deflation). 2002 seems to mark the bottom in the chart. Ben Bernanke must feel very proud. "Mission Accomplished." In any event, we're clearly winning the war on deflation even as home prices plummet. Perhaps "credibly threatening to" use the government's printing press "technology" to print money "at essentially no cost" has something to do with it. I see a major problem here though. What's the opposite of threaten? How does one put the threatening inflationary genie back into the bottle? "Unthreaten" isn't actually a word in the English language. There's probably a very good reason. Once you threaten someone, that's pretty much it. For example, if someone was to threaten me with a gun he'd find it very difficult to "unthreaten" me afterwards. I'd still feel threatened. Go figure. You can be unthreatening of course, but that implies you never threatened in the first place. I think it is safe to say that Bernanke's 2002 speech did not leave me feeling unthreatened. In fact, it has a lot to do with my long-term stagflationary outlook for as far as the eye can see. First, I now have complete faith in the government's ability to debauch its own currency (and/or "credibly threatening to do so") during an economic downturn. Second, I do not have a good feeling about where our economy has been or is heading. Between income inequality, the outsourcing of jobs, and the similarly massive and extremely related trade deficit I find very few reasons to have a positive outlook about our long-term future. The truth of the matter, at least in my opinion, is that there are billions who are willing to work for less than we will and that imbalance will someday be adjusted. The optimists would have you believe that the standard of living of billions will soon match our own. The pessimists would have you believe that our standard of living will soon match those elsewhere. I might argue that the truth lies somewhere in between, perhaps weighted by population. If you mix billions of gallons of water with millions of gallons of fine wine, you don't end up with billions of gallons of fine wine. Of that I am fairly confident. Similarly, it seems highly unlikely that if you mix billions of low paying jobs with millions of high paying jobs that you will end up with billions of high paying jobs. Put yet another way, I don't expect to see billions of people drinking fine wine in my lifetime (not that I drink fine wine either for that matter). Just three years ago, an explosion of conferences, analyst reports, Web sites and magazines predicted the arrival of a new Indian consumer who would change the global retail landscape. The first modern retail stores here were so popular that many entrepreneurs thought people would buy almost anything at any price. They were wrong, as both large and small retailers are discovering. For some, the forecast retail boom that promised jobs for Indians and a new market for global retail giants is already a bust. "I was an eternal optimist; now I have become a realist," says Kishore Biyani, chairman of Pantaloon Retail India Ltd., India's largest retailer by sales, which has revamped its expansion plans as it discovered more about Indian consumers. "Everybody has miscalculated." Meanwhile, I expect more of the same for the majority of American workers. The picture is worse for workers who had no college degree. That's more than 100 million workers, or 72.1% of the workforce. For them there was no 'boom of 1995-2000' whatsoever. Their average real hourly wages were less at the end of 2000 than they were in 1979! And since 2000 their wages have continued to slide further. All this means that economic troubles in the United States could intensify into the presidential election season and beyond. It could also make it harder for financial companies like Lehman Brothers, which has been seeking fresh investment in South Korea, and the government-backed mortgage giants Fannie Mae and Freddie Mac to attract much-needed capital from abroad. As the United States and many other large economies slip in unison, the reality of integrated markets is being underscored: Just as globalization spreads prosperity - linking cotton farmers in Texas to textile mills in China - the same forces spread hurt when times go bad. Reality? Prosperity? The Ocean of Reality? "The slowdown has reached such a wide range of countries that they're now feeding on one another," Ruskin said. NEW YORK (AP) -- Stocks sank in light trading Monday as worries about American International Group Inc. touched off broader concerns that the deterioration of the credit markets will bring more big losses for financial companies. Price is clearly more important than volume. Price is what made it to the headlines. Light trading was of secondary importance. I don't know about you, but I often use the price to calculate my net worth. Volume is not needed in the equation. However, the number of unsold properties hit an all-time high, the latest indication that the worst housing slump in decades is far from over. Prices nationwide are not expected to hit bottom until early next year. Volume is clearly more important than price. Volume is what made it to the headlines. The thought that prices are not expected to bottom anytime soon is a secondary concern. I therefore offer a simple solution to the housing problems. We need to find a way to get even more people to sell their homes. The headlines would therefore look even better. That shouldn't be difficult. We could point out that prices are not stable yet (as seen above) or we could simply point out how many other people are forced to sell in a panic (as seen below). Between 33 percent and 40 percent of sales activity is coming from foreclosures or other distressed properties, estimated Lawrence Yun, chief economist at the Realtors group. Just imagine how great the headlines will look if we can increase that percentage even more. We probably want to stop just short of "Existing Home Sales Skyrocket on Blind Panic and Similarities to Great Depression" though. That might be overkill. I know what you might be thinking. What good could possibly come from increasing real estate sales volumes as I have described it? Plenty of good for real estate agents earning a commission on each sold home one would imagine. "Realtors say..." was the headline after all. Hey, if things get really, really bad in the future perhaps the powers that be might consider putting stock brokers back into the headlines. For example, "Stock Brokers See Record Trading Volume" might cheer us up and add to a sense of overall well being. Buried deep within the article we could see that the stock market actually crashed, but only if we bothered to look. Just a thought. "It is obvious that oil is focusing on things much more complex than simple supply and demand and is looking on the larger issue on the state of the economy," said Phil Flynn, a vice president at Alaron Trading, in a note to clients. Oil has moved well past sentience. It is now all knowing on even the most complex topics and it is watching you. The current edition of Deities & Demigods discusses in detail how one would go about the creation of their own pantheon, as well as individual gods, for use in Dungeons & Dragons. It is time for oil to have its own entry in the book. I beseech thee! ``It is very clear that he is not under any illusions that this is over,'' Princeton University professor and former Fed Vice Chairman Alan Blinder said in a Bloomberg Television interview in Jackson Hole after Bernanke's speech. Hey! This blog resembles that remark! The current environment presents us with new challenges and opportunities at an ever accelerating pace. Perhaps there is a reader braver than myself who can tell me if it is safe to read futher than the first sentence of the article. In the meantime, I'll be in my happy place. LONDON: Looking for the foundations for the next bull market in U.S. stocks? Wait until you see consumers who save much more, have a lighter debt load and can actually sell their houses. In other words, bring a book: it may be a bit of a wait. I offer the following book as a reading suggestion, although I must admit that I have not read it personally. I can say it is over 1,200 pages though. Then again, perhaps an escape from reality would be better. Much of the information contained in this book has been assembled from several decades of research on both the economy and stock market. Some of the conclusions will come into conflict with conventional opinions. However, each conclusion is supported by a "factual foundation" that rests on a body of historic evidence. These revelations could change the way investors think and the way they behave in the future. First, panic! No, just kidding. First, don't panic. Do not panic if your overseas investments tank for a time. Eighth. Panic. Oops. I did it again. Nope, don't panic. Then, panic! Ooops. I did it again. Wow, that's a lot of "don't panic" advice. It reminds me of the bad advice he offered last year (which oddly enough was given the very same day I started this blog: August 31, 2007). Using hindsight, that would have been a great time to panic. The DJIA closed at 13,357. I should state for the record that I am very indifferent to the price of the stock market at its current levels though. I tend to think it may merely stagnate from here, much like it did throughout the 1970s. Here's why I might be tempted to panic this year though. There are still huge risks and the following is one of the biggest risks of all. Fourth, try your best to develop modest habits of life. There is no vice more painful that luxurious habits, says an old Chinese saying, and it's totally true. If you can accustom yourself to modest living, you are far ahead of your neighbors and you are investing in your peace of mind. Imagine what the economy would do if we all took that advice. Picture the malls and restaurants in particular. It also might be worth picturing the government's response. I strongly suspect that tax rebate checks would be the new norm. I doubt deflation will be tolerated by a government and society so deeply in debt. Using a monetary printing press to solve that problem is not going to create more prosperity though. No amount of freshly printed money is going to get me to eat out more. In fact, the more that is sent to me the more likely I'll be hoarding hard goods even more than I already am. That is the ultimate economy killer. The last thing the economy needs to see is everyone playing defect. That being said, I have defected. Shame on me perhaps. I live very modestly these days and it is a permanent change in my behavior. It is better for me individually but it is not better for us as a whole. Unfortunately, it seems much of our service economy needs consumers being serviced. Go figure. Ben Stein isn't my enemy but it is fairly obvious what he fears most. It is a five letter word that stars with a p. That being said, I'm not going to tell you to panic. The saying goes that if you must panic, panic early. It would be hard to argue that we are in the early stages. It might already be too late to panic. Who knows? Heaven help us if it isn't too late to panic though. That would imply there's a lot more pain to come. I would certainly not rule it out. It isn't like I've shut this blog down based on my newfound optimism anyway. The same factors that prompted me to start this blog are all still in play, and as Paul Volcker said in 2005, circumstances are "dangerous and intractable." Three years later we're now told how to prepare for "dangerous times." Isn't that just par for the course? And lastly, I can't imagine a worse time for contrarians. The public is finally starting to notice something is wrong. Is it "safe" to bet against them though? The public also believes that the sky is blue. The herd isn't always wrong. Like it or not, we are ALL part of the herd. Although the emergency measure of the stress response is undoubtedly both vital and valuable, it can also be disruptive and damaging. Isn't that the truth. I've been fleeing since 2004. It may not be financially draining (yet), but it certainly is emotionally draining to say the very least. Further, since there is no safe store of value in a welfare state (Greenspan's comments from 1966) I might just be fleeing the frying pan only to end up ultimately in the fire. Goodyear Tire & Rubber Co. will exit 92 underperforming retail locations by the end of the year, eliminating about $9 million in annual losses. Earlier this month, Goodyear announced a plan to increase commercial tire prices by 10% to offset rising commodity prices. BIRMINGHAM, Ala. (AP) — Alabama's largest county appears headed for the biggest municipal bankruptcy in U.S. history, a $3.2 billion mess created by the nation's credit crunch and a colossal, corruption-riddled sewer project. They aren't the only ones who ran out of dough though. NEW YORK - Cookie retailer Mrs. Fields Famous Brands is running out of dough and plans to file for Chapter 11 bankruptcy protection. Telling the truth is certainly a good start. Declining sales and increased losses are a result of intense competition in the casual dining segment, less advertising of the concepts and a severe downturn in the nation’s overall economy, said Dirk Montgomery, chief financial officer, in a conference call. Competitor advertising took its toll, as did OSI’s failure to offer lunch in its core concepts — Outback Steakhouse, Carrabba’s Italian Grill, Fleming’s Prime Steakhouse and Wine Bar, and Bonefish Grill, he said. Other than the severe downturn in the nation's overall economy, things have never looked better though. Three locals casinos will take a leap of faith when they open their doors in the next eight months. Leap of faith? Oh oh. "It's never ideal to open in a down economic cycle," said Bill Lerner, a Las Vegas-based gaming analyst with Deutsche Bank. "But all of these projects are being built for the long haul, so even though it would be more favorable to open when times are good, they should be able to survive the short term and look ahead to the long term." For what it is worth, the long term is what I'm most worried about. There's got to be a pony in here somewhere! Yep, we're heading to Candy Mountain for sure! There's no stopping the vortex. Zapatero belatedly used the word "crisis" to describe the country's situation last month, touching a nerve with Spaniards who have not suffered a significant economic recession since the big downturn following the Barcelona Olympics in 1992. "There was a state of denial," said Roger Cook, managing director for Spain at Cushman & Wakefield in Madrid. "There was not an appreciation that this was not a slowdown, but a serious crisis." NEW YORK (Reuters) - The vast majority of chief executives are gloomier about U.S. economic prospects than a year earlier, and top company officials have become more downbeat than the public at large, according to a survey released on Wednesday. Surely they can't be more gloomier than me. I'm trying to maintain some standards around here. Can't we just slap some duct tape on the illusion of prosperity bubble and call it good? Some 90 percent of chief executives described U.S. economic conditions as fair or poor, up from 16 percent a year earlier, according to NYSE Euronext's (NYSE:NYX - News; Paris:NYX.PA - News) fourth annual CEO survey, "Managing During Economic Turbulence." 16% to 90% in just one year? I'm going to say the most optimistic thing I've ever said on this blog. The gloominess has gone parabolic and I strongly suspect the top is nearly in. Call me crazy if you must, but I wouldn't expect it to breach the 100% theoretical maximum. Hurray! That being said, I guess CEOs have given up on the Managing During the Great Moderation speech of 2004 though. Oh oh. A gloomy outlook may bode ill for capital spending and job growth at a time when housing prices are falling, unemployment is rising, oil prices remain near record highs, and many Americans say they feel like the economy is in recession. Yet CEOs are apparently more pessimistic than the public at large? What exactly is it that THEY see coming? "The U.S. now faces the terrible combination of high and rising commodity prices -- inflation -- with low demand," Liveris said. "It's a situation we've not seen in the U.S. since the 1970s, and it makes for tremendous uncertainty." Queue the 1970s style sunshine.